There’s something special about a fresh pair of shoes right out of the box. From that new shoe smell to the unblemished look—we all love a brand new pair. Of course the more you wear your favorite pair, you have to understand that a little dirt or grime will show up over time. Or if you’re unlucky, you’ll accidentally step in mud—or something worse! And if we’re talking about kids—all bets are off when it comes to keeping anything they wear pristine. Fortunately, we have some tips to help keep your Skechers in the best shape possible. With proper care you can extend the life and look of your favorite pair. Never machine wash light-up shoes—or any shoes that include any form of electronics. The batteries and wires don’t like being fully submerged in water! For regular non-leather sneakers, first try to hand wash the shoes with cold water using a damp cloth with a mild detergent. Most non-leather casual shoes can be safely machine washed—if needed—on the gentle cycle and air-dried. Apply a protectant such as Skechers Water Proofer Spray to guard the shoes from water and stains. For shoes with Skechers Memory Foam™ insoles, allow shoes and insoles to air dry for 10 to 12 hours to ensure the insoles are fully dry. Machine washing Skechers GOwalk and Skechers GOrun shoes is not recommended. Start by removing excess dirt from the upper and outsole by using a small brush or towel. Then create a soapy mixture by combining warm water and a small amount (a few drops) laundry detergent. Finally, dip the brush or cloth into the soapy mixture. Wipe down the affected area. Apply a small amount of clean, warm water with the brush or cloth and brush/wipe off the excess soap. Allow the shoes to air dry. Apply a protectant such as Skechers Water Proofer Spray to guard the shoes from water and stains before wearing in wet conditions. 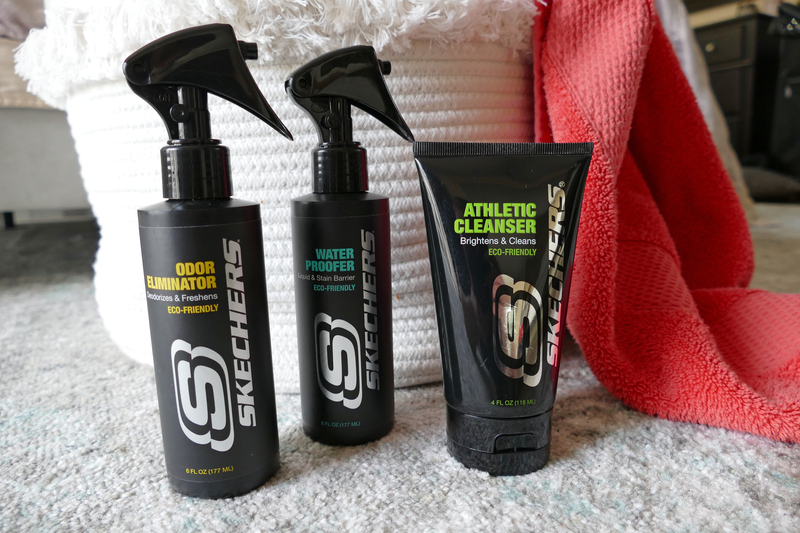 Use a leather cleaning lotion or spray such as Skechers Athletic Cleanser to clean. Apply a leather lotion or oil periodically to keep the leather supple. Do not machine wash leather shoes. For smooth leather, the shoes will need cleaning and care with shoe creams or polishes. Select a neutral shade or a color nearest to the color of the shoes. Remove all the dust with a damp cloth. Never polish wet shoes. For scuff resistant leather, remove minor scuffs by simply rubbing them with your hand. The natural oil in your hand restores the original look of the leather. For deeper scrapes and scuffs, use a soft and neutral polish. This process moisturizes and replenishes the natural oil in the leather leaving a shiny coating that will prolong and sustain the wear of the leather. Apply a protectant such as Skechers Water Proofer Spray to guard the shoes from water and stains before wearing in wet conditions. Do not machine wash suede or nubuck shoes. When shoes are dry, brush with a dry rubber sponge or soft brush to eliminate any clinging dirt. Regular use of a soft brush will keep the nap of the suede free from dust. Stubborn stains should be removed with commercial stain remover suitable for the suede or nubuck material. Machine washing light-up shoes is not advised as it may damage the lights. Clean with mild soap, warm water, and a soft cloth. Never put wet shoes in a clothes dryer or near a heat source—this includes anything that would force dry your shoes like a radiator, tumble dryer, fireplace, hairdryer or any other source of direct heat. The heat source may melt or otherwise damage your shoes. Always allow shoes to dry naturally at room temperature. Stuff the shoes with paper and let them air dry. Use a shoetree to help your shoes maintain their shape when not in use. 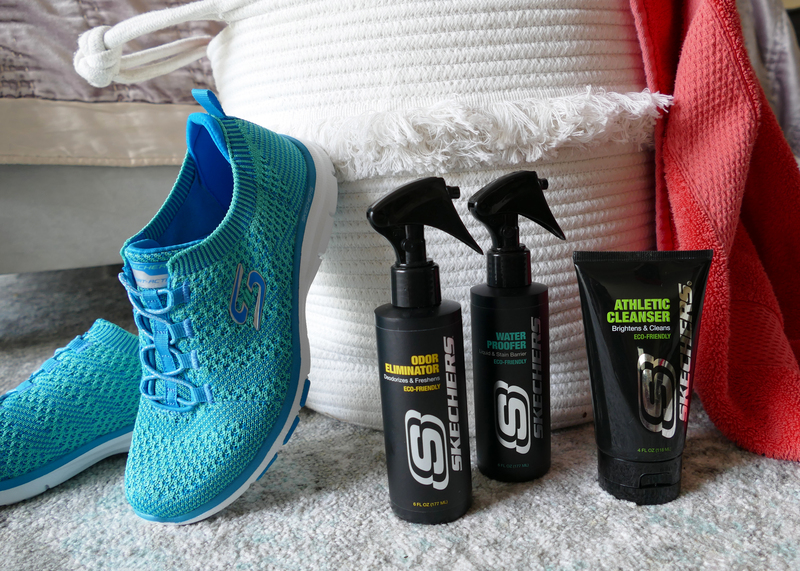 Apply a deodorizing product such as Skechers Odor Eliminator Spray to keep shoes fresh and odor-free. This spray is specifically formulated to deodorize and freshen Skechers footwear and you can find it on SKECHERS.com here. Another effective solution to this issue is Baking Soda or Activated Charcoal (which can be found at most pet stores that sell fish tank/aquarium items). Simply put the powder of your choice in a bag, set your shoes on top of the powder, tie up the bag and let the shoes sit in the bag for 2 to 3 days. How do I clean my spring color striped Bobs canvas type shoes? Hi Dianne, Canvas shoes are best cleaned by using the same steps as 1 and 2 on this blog. Either “safely machine washed—if needed—on the gentle cycle and air-dried”, OR “removing excess dirt from the upper and outsole by using a small brush or towel. Then create a soapy mixture by combining warm water and a small amount (a few drops) laundry detergent. Finally, dip the brush or cloth into the soapy mixture. Wipe down the affected area. Apply a small amount of clean, warm water with the brush or cloth and brush/wipe off the excess soap. Allow the shoes to air dry.” Hope that helps, have a great week! Hi Caroline, Thanks for bringing that to our attention. Perhaps it was for a leather shoe as opposed to a shoe made with a fabric upper. You can be hand washed using mild soap, warm water and a soft cloth or safely machine washed on the gentle cycle and air-dried. Do not place shoes in dryer. Hope this helps! Sorry to tag onto your comment. Went to get gas during our first snowfall of the year and got gasoline on the soles of my go walk shoes. How do I get rid of the smell??? Should I buy replacement Skechers? Please help asap. 2. Create a soapy mixture by combining warm water and a small amount (a few drops) diluted Woolite or laundry detergent. 5. If the smell is still there usually baking soda or activated charcoal solution is best to remove the odor-causing agents, as that absorbs and nullifies anything causing a smell. If sealing them in an airtight bag containing an odor-absorbing material is not enough to absorb the smell, you may want to try using a second or third treatment – activated charcoal really is the best odor-absorbing material, it’s what they use in industrial cleanups. How do I get the Odor eliminator to spray? I squeeze the trigger and nothing happens. Does it come locked? Hi Jose!There is a little button on the side that says “on”. Push that in to spray and then push it from the other side, where it says “off” to lock it again. Hope this helps! Can I machine wash Skechers microburst one up shoes please . How do I clean my women’s goga mat boat shoes. The insoles are dirty! How do I wash white/silver Galaxies iridescence (2289/WSL)? I’m afraid rubbing it will “pick up” the silver thread running through these mesh shoes. And I sure don’t want them turning yellow as I saw in another comment. Hi Rajedeepsinh! Majority of our shoes unless they are suede or leather can be hand washed with a washcloth and soap and then air dryed or put into the washing machine on a gentle cycle and then air dried 🙂 please refer to the blog on what type of material works best with what cleaning method! Hope you have a great weekend! Your blog says machine washing GOWalk is not recommended, but in the comments section you tell someone they can be machine washed. Which is it? I have a pair that I absolutely love, but they really need to be cleaned. Hi Traci, we don’t recommend machine washing them. For the best results, we recommend using a small brush to clean surface spots and then creating a soapy mixture of warm water and a few drops of laundry detergent, which you can use with a brush or cloth to thoroughly clean the shoes! I have a pair of Go Walk 2 that i’d like to wash. I see I can put them in the washing machine , wich is so satisfying , but do i put them in alone or with something else ? My daughters both have Skechers light up shoes. They were playing near our pond and now both their shoes smell of pond water. How can I wash the smell out? I have the knit Empress flats (style 23110). Can these be machine washed as they’re mostly knit fabric? I have Sketchers Sport shoes that I wore twice to the Ren fest. They were black and are no longer black (because a lot of dirt). Can they be stuck in the washer? Hi .. I have had my Gostep lite for 6 weeks and they smell horrid !!!!!! I don’t usually suffer with smelly feet , but this is extreme, I’ve heard lots more complaining they develop an horrendous smell. I own other 6 other types of sketchers, and they don’t smell. How can I get rid of the smell . Can I put my Go Step Light and the GoGo Max inserts in the washing machine? I have air cooles memory foam gray in color how do I wash them? I have air cooled memory foam gray in color can I machine wash then air dry? Yes! We recommend hand washing but it should be OK to wash on gentle and then air dry! What is the order of caring for Sketchers leather shoes? E.g. clean, condition with leather lotion/oil, polish, then waterproof protect? We advise using a leather cleaning spray or lotion to clean the leather uppers, and the non-leather parts of the shoe can be cleaned with mild soap, warm water, and a soft cloth. I got olive oil on my Go Walks while cooking. I’ve tried to clean them several times using warm water and detergent but I’m not able to remove the spots. Any recommendations? Hi Jane, most non-leather casual shoes can be safely machine washed on the gentle cycle and air-dried! Worn my sketchers about a dozen times since new. 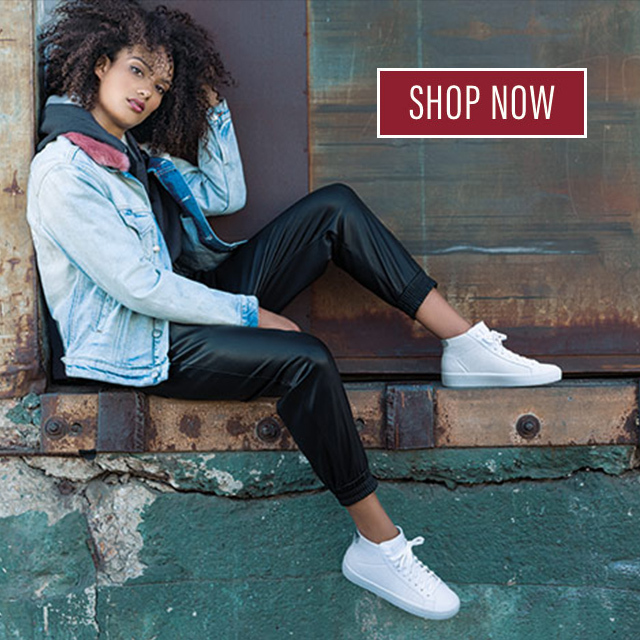 today it is wet outside and the soles leak like a sieve..
Hi Sean, there is a Waterproof category under Technologies on Skechers.com – any shoes listed in that Technology category are fully seam-sealed waterproof. This includes shoes such as the GOtrail 2 running shoe, several GO GOLF shoes, all of the shoes and boots in the Segment collection, the Marauder – Mushogee, and many other boots and work boots. How do I wash “ON THE GO GLIDE – 53764”? Please advise. Thanks. Hi Keisha, have you tried running it through the washing machine on the delicate cycle? Put them in a laundry bag and air dry only. When air drying please allow 10 to 12 hours for insoles to fully dry. How about a pair of “YOU” walk. They are a canvas type (gray and white speckles), but have the soft mat on the inside? They are extremely dirty! I have just got some Womens Inspire You in light grey and managed to get muddy water on the top of the shoes. What is the best way to clean them please? Hi Hannah, you can wash them on the delicate cycle, just make sure you put them in a laundry bag and air dry only! Hi I have a pair of Black D’Lites with memory foam that a dog decided to pee on. Can these be machine washed? Hi Wendy, leather shoes can not be machine washed unfortunately, however you can remove the Memory Foam insoles and wash them on the gentle cycle. Just make sure to air dry only and allow 10 to 12 hours for wear. Use a leather cleaning spray to clean the uppers of your shoes and the non-leather parts can be cleaned with mild soap, warm water, and a soft cloth. Hi Marcia 🙂 Most non-leather casual shoes can be safely machine washed on the gentle cycle and air dried. For leather shoes we advise using a leather cleaning spray or lotion. The non leather parts of the shoe can be cleaned with mild soap, warm water, and a soft cloth. Hi Mishaal, you can wash them on the delicate cycle. Just put them in a laundry bag and air dry only! I have a front loading machine. Has anyone washed the Gowalk shoes in a frint loader? Hi Cathy, they should be fine as long as you wash on the delicate cycle and air dry! I have 3 different styles of Bobs with memory foam. My most recent purchase are for work. I work in a dentist and they offer great support, however they are beginning to smell horrible and my feet even have an odor after removing the shoes. What do you recommend to eliminate odor? The Sketchers Odor Eliminator is not available where I live. Also what can be done to prevent this odor from being recurrent? My other 2 shoes I dont wear daily so Ive never had this problem before. Hi Xe, Thank you for reaching out! You may apply a deodorizing spray such as Skechers Odor Eliminator Spray to keep shoes fresh and odor-free. Usually baking soda or activated charcoal solution is best to remove the odor-causing agents, as that absorbs and nullifies anything causing a smell. If sealing them in an airtight bag containing an odor-absorbing material is not enough to absorb the smell, you may want to try using a second or third treatment – activated charcoal really is the best odor-absorbing material, it’s what they use in industrial cleanups. The GOwalk Joy shoes can be hand washed using mild soap, warm water and a soft cloth or safely machine washed on the gentle cycle and air-dried. Do not place shoes in dryer. Apply a protectant such as Skechers Water Proofer Spray to protect the shoes from water and stains. For shoes with Skechers Memory Foam™ insoles, allow shoes and insoles to air dry for 10 to 12 hours to ensure the insoles are fully dry. Can I wash my Sketcher golf shoes? They are the birdie tropic and birdie famed. How should i clean my Sketchers Go Step Lite-Lux shoes since it has a mesh fabric upper and padded heel lining ?? Please reply me soon. Thank you for reaching out! Most non-leather casual shoes can be safely machine washed on the gentle cycle and air-dried, we suggest placing them in a pillowcase or laundry bag before washing in machine. Do not place shoes in dryer. Do not machine wash light-up shoes. Apply a protectant such as Skechers Water Proofer Spray to protect the shoes from water and stains. For shoes with Skechers Memory Foam™ insoles, allow shoes and insoles to air dry for 10 to 12 hours to ensure the insoles are fully dry. Hope this helps! Hi , I have a pair of Synergy 2 Skechers. Can I machine wash them? Hi Leo, Do you have the style number for this item? Hi – How should I clean my SN22836 white memory foam shoes? Can I machine wash & air dry? Hi Karen, Apply a protectant such as Skechers Water Proofer Spray to protect the shoes from water and stains before wearing in wet conditions. Use a suede/nubuck cleaning product to clean shoes. Brush with a suede brush for best results. Do not machine wash suede or nubuck shoes. Allow to air dry. How do I was my white mesh Bob’s from sketchers. Hi Roxanne, Do you have the style number for this item? How do I clean my Skechers Work Relaxed Fit Cankton Men’s Steel-Toe Shoes? My dog got excited and peed on them and I have to get them cleaned inside and out. Hi Michael, Thank you for reaching out! We would not recommend machine washing these work shoes, as they have a leather upper that could be stained or damaged by prolonged water exposure. Instead we recommend cleaning the leather parts of the shoe using a leather cleaning spray product. The non leather parts of the shoe can be cleaned using mild soap, warm water and a soft cloth to wipe clean. Also, we don’t recommend putting steel toe shoes in your washing machine, it may damage your washer once the spin starts. Hope this helps! 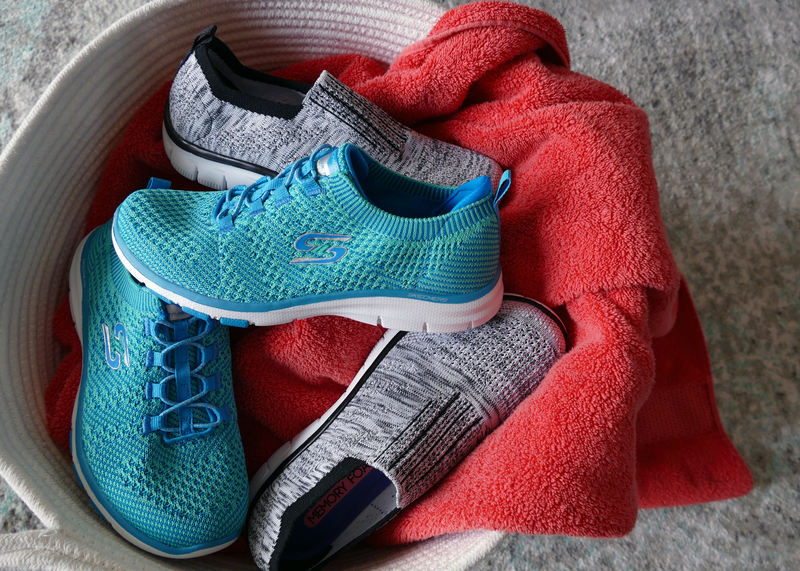 Hi – can I put my Skechers GoGolf SN14864 shoes in the washing machine to clean them? Thank you. Hi Marian, Thank you for reaching out! We recommend hand washing these using mild soap or diluted gentle-cycle detergent, warm water and a soft cloth. Hope this helps! Hi – I’ve just ordered a pair of Skechers Women’s Go Step-Riptide Boat Shoes in a light colour. The description says the outer material is ‘synthetic’ so I’m wondering what will be the best way to keep them clean. Hi Judy, Thank you for reaching out! Many customers tell us that these shoes can safely be machine washed. We recommend washing on the gentle cycle cold, placing both shoes in a laundry bag or pillowcase, and air dry only. Hope this helps! What about the new Skecher Goga black sandal smelling like an old sneaker after only having three weeks? I have never had any sandal smell like a dirty sock. How do you rid that? These shoes are great for my injury for walking, but for 50 bucks they should not smell, especially a sandal I wear to an office or to grocery store and no where else. I tried wiping down, without luck. Not like I don’t bathe every day lol! The store will not take back, so now I am searching for a comparable shoe as afraid of this happening with another pair of them. I have always been a fan of Skechers products so this was disappointing. Hi Denise, Sorry to hear about this situation. Please email detailed information to socialmedia@skechers.com so we can connect you with a customer service specialist who can further assist you with this? Thanks! Best way to clean white go golf shoes? Hi Colin, Thank you for reaching out! Do you have a specific style name or number? Some of our golf styles have a waterproof leather upper – We recommend applying a leather lotion or leather oil every few months to keep the material supple and moisturized. Clean using a leather cleaning spray treatment. Hi Colin, Thank you for providing the style information. The GO GOLF Drive 2 – RF is a smooth leather upper, so we recommend giving the uppers a treatment with a leather lotion or leather oil every couple of months to keep the leather supple. You should not need to use any protectant since the shoes are fully waterproofed as they come. You could apply a neutral colored shoe polish if desired, but we don’t recommend a colored polish as that may dry out the leather finish. Use a leather cleaning spray to clean. A standard golf spike cleaning tool should be fine for cleaning any debris out of the sole. Hope this helps! I have a pair of Skechers Go Step Mary Janes (Product ref. 15407). They are blissfully comfortable, but after 10 days wear they stank to high heaven. I have tried hand washing and air drying them; using Febreze spray on them, a ‘trainer deodorizer’ spray, bicarbonate of soda and activated charcoal, but NOTHING gets rid of the smell. The smell also seems to be coming from the actual sole of the shoe, rather than just the insole. I have had a number of Skechers shoes and have never had this problem before. Looking on various blogs and website, I can see that this is a common problem. These shoes were not cheap, and I feel that Skechers need to address this! I now have a pricey pair of comfortable shoes which I cannot wear without offending everyone around me!! Hi Chris, Sorry to hear about this. Please email details to socialmedia@skechers.com so we can connect you with a customer service agent who can look into this? Thanks! Can I wash my You Walk shoes in the washing machine? If yes, any particular cycle preferred (normal, quick, gentle, delicate, etc)? Also, can I then use the air dry option on my machine? Hi Anisha, Thank you for reaching out! The YOU by Skechers shoes I would advise hand washing with mild soap, warm water and a soft cloth. Machine washing is not advised, though some customers advise they have done so – they recommend washing on the gentle cycle, placing both shoes in a laundry bag or pillowcase, and air dry only (no machine drying). Hope this helps! The only shoes thats smell when i use them are my skechers. I’m quite fed up with this. Skechers are nice and very comfortable but i’m really thinking of not buying them anymore. Hi Kris, Thank you for reaching out! Usually baking soda or activated charcoal solution is best to remove the odor-causing agents, as that absorbs and nullifies anything causing a smell. If sealing them in an airtight bag containing an odor-absorbing material is not enough to absorb the smell, you may want to try using a second or third treatment – activated charcoal really is the best odor-absorbing material, it’s what they use in industrial cleanups. Hope this helps! any advise about reinforcing/protecting the mesh shoes around the toes? My daughter ripped holes in her last pair from sitting on her heels. She loves this style but I’d like to try to prevent the same thing happening again. Hi Megan, Thank you for reaching out! You may want to try an reinforcing fabric with adhesive backing and apply it to the problem area. You may find these fabrics at most fabric stores. Hope this helps! I have a pair of mens brown Status-Melec boat shoes, I would like to know how to clean them please. Hi Jimmy, Thank you for reaching out! We recommend that you hand wash using mild soap, warm water and a soft cloth. 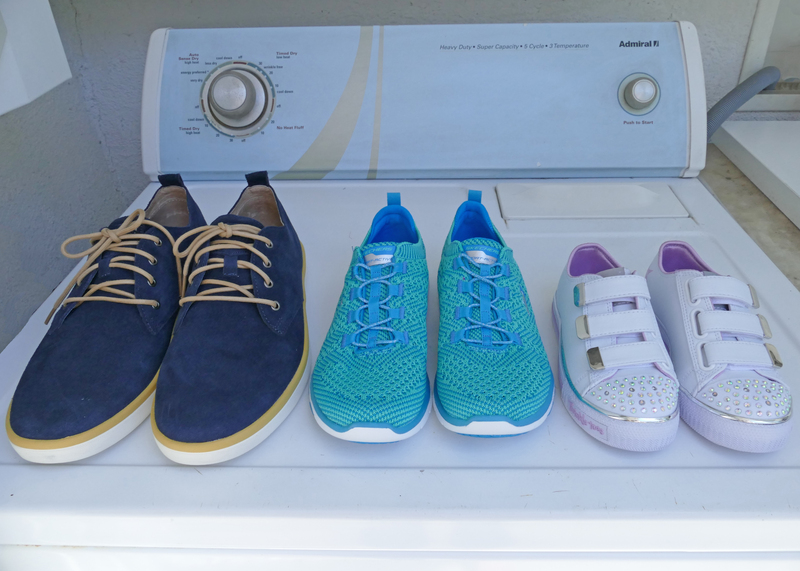 We have heard from customers who machine wash these shoes to good effect – they recommend washing on the gentle cycle, placing shoes in a laundry bag, and air dry only. Do not place shoes in dryer. For shoes with Skechers Memory Foam™ insoles, allow shoes and insoles to air dry for 10 to 12 hours to ensure the insoles are fully dry. Hope this helps! Hello! How can I clean my Skechers Bobs From Womens Highlights High Jinx Wedgem (cream color) ? Thank You!! i have a pair of GO2 sketchers light grey cloth. stained and losing colour from too many washes.will this material dye anoiher darker colour. they are very comfortable and i dont want to disgard them. Hi Keith, Thank you for reaching out! You can definitely try to use material dye at your own discretion. It may take on that type of fabric but of course results may vary. You may want to try cleaning the problem areas with baby shampoo or diluted Woolite, that tends to work well. A magic eraser for the soles usually works well also. Hope this helps! i want to protect my64502/CDB leather uppers.Can i use mink oil? Hi Paul, Thank you for reaching out! The Rayland has an oiled leather upper, so we would recommend using a product such as the Skechers Water Proofer spray to protect the material. A product such as the Skechers Cleaner or a leather cleaning spray would be good for cleaning these. We would also recommend a leather lotion or leather conditioning product to keep the material supple. I have the outdoor Skechers go-walk waterproof shoes. They work by the way! Wore them to an outdoor concert where it ended up raining all day. They are now completely covered in mud. What is the best way to get them clean? I love these shoes. Hi G, Thank you for reaching out! Do you have the style number for this specific style so we may better assist you? Thank you for reaching out! Remove excess dirt from the upper and outsole by using a small brush or towel. Create soapy mixture by combining warm water and a small amount of laundry detergent. Use cloth to wipe down affected area. Allow to air dry. Hope this helps! I have Sketchers Go Run shoe..I am trying to wash Inside shoe sole pad.While i am removing sole pad, i found that it is attached with Gum..Can i remove sole pad wash inside shoe and keep back sole pad? Will That gum will attach properly? Thank you for reaching out! You may want to try a tiny bit of a product called GOO Gone which is an adhesive remover, this may help in the process of removing the glue on the insole. Remove excess dirt from the upper and outsole by using a small brush or towel. Create soapy mixture by combining warm water and a small amount of laundry detergent. Use cloth to wipe down affected area. Allow to air dry. Hope this helps! Can I machine wash my Gen 5? How about my Sport-Active Dual Lite walking shoes? Hi Sandra, Thank you for reaching out! Remove excess dirt from the upper and outsole by using a small brush or towel. Create soapy mixture by combining warm water and a small amount of laundry detergent. Use cloth to wipe down affected area. Allow to air dry. Hope this helps! I have sketchers H2GO sHEILD wATER rESISTANT Go Golf Eagle Major 14863 White/Multi. They were looking really dirty so I tried doing as you say by hand washing and now the white is stained a browny-yellow on the fabric near the toes so that hasn’t worked. How do I get them looking white – can I put them in the washing machine? Hi Jane, Thank you for reaching out! We would not suggest machine washing this item but you may want to try using a ‘Magic Eraser’ type of product. Some customers have reported good results when cleaning this style using such item. Hope this helps! I just purchased a pair of white Skechers GoWalk Joy VIVFY shoes. The tag inside says the upper material is man made. So not leather and not nylon. I actually can’t tell what the material might be. All that is to say I don’t know how to clean them based on what is mentioned above. Hi Donna, Thank you for reaching out! Remove excess dirt from the upper and outsole by using a small brush or towel. Create soapy mixture by combining warm water and a small amount of laundry detergent. Use cloth to wipe down affected area. Allow to air dry. Some customers say ‘Magic Eraser’ cleans the outsole well. Hope this helps! I have a pair of Women’s Flex Appeal 2.0-Bold Move Black/Charcoal 12773/BKCC for the gym. I use a deodorizer spray in them but would like to wash all the sweaty goodness out of them. Can I machine wash them? Remove excess dirt from the upper and outsole by using a small brush or towel. Hi I’ve just bought a pair of Black “Go Golf Focus 2” golf shoes – can I use black shoe polish on them – not sure what leather oil or leather lotion is. Finally the literature that came with the shoes mention a “warranty” and and replacement cleats which I presume are soft spikes details of which are detailed on page 48 however the catalogue stops at page 45 – Can you help ?? Hi Kev, Thank you for reaching out! We would suggest cleaning this item using a leather cleaner, and keep fresh with a neutral polish product. Good day ! I recently bought your “Skecher Street – Los Angeles MODA-PERSWAYED”, the light pink one. I would like to ask your tips on how to clean it because it has different kind of fabric. We tried washing with water and soap because of dirt, it kinda changes the color of the fabric and as it got dried, some of its color turned to rust-like color. And as observed, as washed with soap, its texture became slippery. Hoping for your reply. Thank you so much ! 1. Remove excess dirt from the upper and outsole by using a small brush (suede brush) or towel. Perhaps purchasing a suede cleaning kit. 2. Brush to remove scuff marks. 3. Use an eraser for stubborn marks. 4. Protect your suede using a treatment with a water proofing spray or applying a fabric protectant such as Scotchguard to the uppers to make them water resistant. What do you recommend for cleaning the soles on the Skechers Work Slip Resistant shoes? I work in a busy deli and at the end of each shift I have to spend considerable time using hot soapy water and a small hard brush to remove accumulated food residue that builds up. Regardless it is difficult to remove it all and a very strong odor develops. Is there a specific brush or tool or process otherwise that is more effective? I am already essentially following your suggestion. I just thought you may be aware of a more specific brand or style narrow brush that can more effectively reach within the very narrow grooves in the slip resistant sole, i.e. more narrow than a tooth brush, but obviously much more rigid. I’ll keep looking, but let me know if you have a suggestion. P.S. Obviously I would never machine wash leather work shoes. LOL. Hi Bill, Thank you for reaching out! You may want to try a Straw Cleaning Brush which is more narrow than a tooth brush. Hope this information helps! I’ve just bought a pair of go golf pro 3, what’s the best way to clean them and have them last? How do you clean Skechers Relaxed Fit Wolden Desert shoes. I cannot tell whether these shoes are nubuck, suede or leather. Thank you. 1.Remove excess dirt from the upper and outsole by using a small brush (suede brush) or towel. Perhaps purchasing a suede cleaning kit. 2.Brush to remove scuff marks. 3.Use an eraser for stubborn marks. 4.Protect your suede using a treatment with a water proofing spray or applying a fabric protectant such as Scotchguard to the uppers to make them water resistant. I just purchased 3 pair. What is the best way to clean and dry the shoes. Hi Robert, Thank you for reaching out! To maintain the quality of your purchase of our shoes, we do not recommend machine washing. We suggest the following steps for any minor cleaning to our shoes. Remove excess dirt from the upper and outsole by using a small brush or towel. Create a soapy mixture by combining warm water and a small amount (a few drops) laundry detergent. Dip the brush or cloth into the soapy mixture. Wipe down the affected area. Apply a small amount of clean, warm water with the brush or cloth and brush/wipe off the excess soap. Allow shoes to air dry.